(CNN) - The dance craze that's been sweeping the nation has made it to the campaign trail. Senate Minority Leader Mitch McConnell's re-election team Wednesday put out a web video of a person wearing a mask of the Republican senator from Kentucky dancing to the Harlem Shake. The dance move has been going viral online for about a month, with YouTube saying that the search level for Harlem Shake videos has been skyrocketing. The craze has even spread up in the air, with recordings of people doing the dance aboard a commercial flight and sky diving. Now the dance has spread to the 2014 midterm elections, when McConnell, the top Republican in the Senate, will make a bid for a sixth term in the chamber. 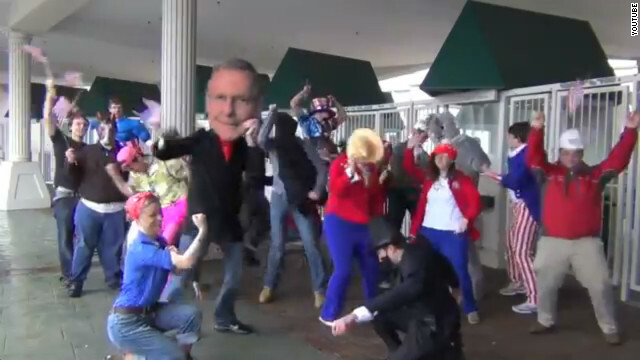 The 49-second video starts with a person wearing a McConnell mask dancing to the Harlem Shake outside Churchill Downs, site of the Kentucky Derby, which is just a few minutes from McConnell's re-election campaign headquarters. The person is then joined by at least a dozen other people, many of whom are wearing red, white and blue garb, and even someone in what appears to be an elephant costume, also dancing the Harlem Shake. The McConnell campaign tells CNN that the people in the video are college students from nearby schools who "approached us about shooting it because they are all fired up to volunteer for Team Mitch!" "We are putting it out because we plan to work hard but also plan to have a lot of fun," said McConnell campaign manager Jesse Benton. This new web entry by the McConnell campaign is vastly different in nature than their last video, which criticized activist actress Ashley Judd, the only Democrat seriously considering a challenge to McConnell next year. Congress needs to work. Term-Limits are the dire need for this nation at congress/senate level. They are just playing with free money. Ha Ha...Tea Party Racists using the Harlem shake to improve their marketing image to young folks. LOL ....Why don't you hypocrits use the dueling banjos from "Deliverance" ???? much more appropriate for your toothless supporters. The Harlem Shake is the dumbest craze ever. Although, I guess it is useful in pointing out the idiots in our society. Mitch McConnell would have spent his time better dancing on the recent day where he filibustered his own proposal! You can't be a bigger obstructionist than that! He exemplifies all that is broken about the Congress and is one big reason why Kentucky remains in the ranks of the bigoted, ignorant, xenophobic, homophobic, and fearful red states. That's not the Harlem shake. Hey Man, that Mitch is one groovy, groovy hep cat! How he deserved to be elected again is mind boggling. His wonderful job was to conspire and declared to unseat democratically elected president by road blocking progress. Even the Harlem Shake cannot make this partisan hack humanized. I find it amazing that this guy would even have a chance, let alone a big win, all one has to do is research, repubs know that some will believe without question, that is too bad, they dont deserve to be there. McConnell is phonier than a $3 bill and that's not even the real version of the Harlem Shake. Really? Harlem Shake was so....January. Can we really expect Mitch McConnell to be relevant to the American people if his campaign staff can't even remain sufficiently current with viral trends to make him look like anything other than somebody's drunk dad at a wedding? Didn't Diddy invent the Harlem Shake back when he as still Puff? Of course, not to be outdone, Boehner has been promoting vidoes of himself doing the Dougie. The only "shake" going on is the shake down of the American people by a senator who won't do his job. Govern!! !